ethnicity in politics | THE POLICY THINKSHOP "Think Together"
There is no larger, more monolithic group in the US with less power and with less representation at all levels of the civic and private sectors of American society. Of the 53 million hispanics, a whopping 33 million plus are Mexican American. This means that the current immigration impasse is largely, both internally and externally, a Mexican problem. You can think of it as a “Mexican American Problem” or as purely a Mexican problem but in any case, Mexican Americans are a relatively monolithic community with a strong sense of their past, and an ongoing connection to the mother land (incidentally, Mexican Americans do not have to divide their loyalties between North America, i.e., the USA, and modern day Mexico, because the lands between the Rio Grande and the territories beyond the Alamo have largely been one continuous playground to a Mexican community that can easily claim to be Native American. The so called “pilgrims” have a weaker claim. “The Hispanic population grew to 53 million in 2012, a 50% increase since 2000 and nearly six times the population in 1970, according to the most recent U.S. Census Bureau data. Meanwhile, the overall U.S. population increased by only 12% from 2000 to 2012. Hispanic population growth accounted for more than half of the country’s growth in this time period. Much of the growth is occurring in a relatively small geographic area. A Pew Research Center analysis last year found that the 10 largest counties by Hispanic population accounted for 22% of the national Hispanic population growth between 2000 and 2011. Half of these counties are located in California. More via The U.S. Hispanic population has increased sixfold since 1970 | Pew Research Center. American immigration enforcement is necessary. It’s goals and means at the present time may need reforming though. Fueled by fear and political opportunity in the aftermath of the post 911 decade, this policy went into full force in 2010, despite the fact that so called “illegal immigration” had significantly tapered off. The Obama administration, nevertheless, went full force ahead with this policy to appease popular fears and to give a sense of being tough on crime and of being pro national security. It is clear that the affect of the current immigration policy is disproportionately falling on the Latino immigrants. It is also labeling them criminals. THIS POLICY MOST BE REASSESSED… In light of the hardships that illegal immigration causes for men and families running away from political, economic stress or toward the pull of the American dream, and the problems that it causes for an America whose labor markets have been themselves greatly stressed by the long, deep and lingering national recession, perhaps we need to take a good long look at how America is investing in its labor force and how it might better integrate and recruit needed talent from its neighbors to the south. America will continue to age at an alarming baby boomer pace, by the time we hear all the reports of the “unintended consequences” of the current skewed immigration policy it may be too late. People from Asia, for example, are underrepresented in the ICE immigration dragnet. The connection to immigration from the Eastern European former soviet block and Russian gangs, for example, is also missing from the national security report. Although we should not paint former Soviet block countries with a broad brush, the absence of many other groups from the demographics of this dragnet needs closer examination. The data provided by ICE shows that most of the immigrants being affected by this policy are involved with the criminal justice system or are coming across our southern border from a handful of Latin American countries (see table 1 below). Coming across the border without appropriate immigration paperwork is itself a violation of our national laws. ICE conducted a total of 368,644 removals. ICE conducted 133,551 removals of individuals apprehended in the interior of the U.S.
82 percent of all interior removals had been previously convicted of a crime. 59 percent of all ICE removals, a total of 216,810, had been previously convicted of a crime. ICE apprehended and removed 110,115 criminals removed from the interior of the U.S.
ICE removed 106,695 criminals apprehended at the border while attempting to unlawfully enter the U.S.
More via FY 2013 ICE Immigration Removals. America is in an ideological tug of war: Can we do better? Too often, American public policy discussions are framed in single issue debates of pros and cons which make for great media theater and water cooler conversation–but never end in solutions… only in winners and losers. To be sure, the real losers are once again the shrinking middle-class which continues to see a broken Congress continue to destroy the country. An American dream Hollywood built and the middle-class made sustainable by working itself out of the working class and buying into the popular media illusion. This “progress” now seems out of reach for much of the children of that middle-class and for recent immigrants. So where is America going? What will happen to an America where honest and bipartisan discussion of real public policy problems is muffled by cable show sensationalism and campaign politics? Can we do better? Immigration is not only about people staying in America without a proper visa or citizen status; it is also about the American continent and the millions of people that have called it home for well over a thousand years. From the perspective of native Americans the question is: Who is the illegal immigrant, pilgrim? This includes millions of modern day South of the border Latinos whose ancestors have roamed across the Rio Grande for thousands of years. From the perspective of the Eurocentric 1st, 2nd or 3rd generation American the clamor is: Go back to where you came from; you are not a real American. As America fails to sustain a middle-class and integrate new immigrants it dies a thousand deaths one broken dream at a time. Mortgage foreclosures, drug abuse, urban decay, and dead end jobs that cannot pay for healthcare or sustain a family are but a few of the pervasive signs that America is not only divided but headed in the wrong direction. how much it will all cost. The outcome of those choices and the quality of that debate ultimately impacts the cultural and economic health of the country. American is killing its life source–IMMIGRANTS. As such, it is killing itself. For this we can all agree President Obama has failed to lead in this most important of public policy problems. 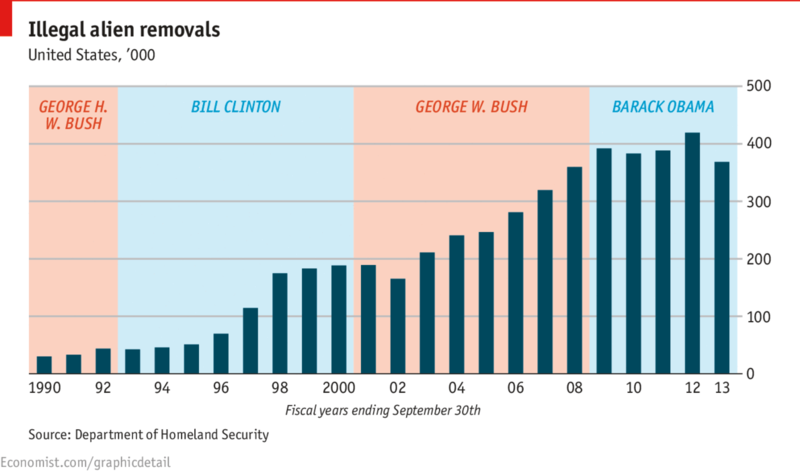 via Daily chart: Obama and aliens | The Economist. The American political and sociological imagination is fixated on a civil rights trajectory for Hispanics/Latinos. As if the civil rights movement could be extended or repeated, Hispanic/Latino demographics are constantly cast in the shadow and path of African American progress. But is this reasonable and likely? The notion that communities have leaders is as old as Plato’s Republic and perhaps the Magna Carta. But how true is that notion for ethnic communities in the US? Is there a leader or group of leaders of the so called “White community”? Is there a leader or leadership group of the so called “Black community” today we can readily and unanimously point to? Is the concept of “community leadership” historically and politically valid when it comes to defining communities that are diverse and geographically dispersed? Perhaps there have been important leaders of visible political movements that have made a significant impact on the popular mind; but making the argument that there are definitive leaders of an entire community may not be as valid as defining the leader of a social movement with an obvious leadership voice and sometimes face; such as the civil rights movement and Martin Luther King. But Hispanics/Latinos have not had such a national movement and they are as diverse as the continents and countries their ancestors come from. So why do we insist in assuming that Hispanic/Latino contributions to and demands from the American polity will follow the same trajectory? So where does this leave us for today’s so called “Hispanic or Latino” community? Is the notion that disparate and diverse loosely defined social groups, that have a leader or group of leaders that can speak for them, still valid today? MORE via Three-Fourths of Hispanics Say Their Community Needs a Leader | Pew Hispanic Center. Can modern government police itself? Has the American government gotten too big and too powerful in the age of big data, billion dollar budgets and heated global competition for its centenarian constitution? Are we too quick to personify the bureaucratic colossus and expect it to respond like an ethical and nimble organization? Have citizens become too powerful, overwhelmed and confused when given access information and the ability to disseminate it to the four corners of the earth in one instant? Technology and humanity have finally reached a turning point. Human possibilities are magnified immensely by technology for bad and for good. What is America’s relationship to the world as it looks out on the horizon of international intrigue and what is its relationship inward toward its citizens’ civil rights? “THERE was something surreal, in a Kafkaesque sort of way, about Barack Obama’s press conference on August 9th. Aiming to ease concern over the government’s surveillance programmes, the president announced reforms that seem both obvious and overdue. Then he criticised the man whose actions set those reforms in motion. The president’s proposals include creating a group of outside experts to assess the government’s balancing of security and privacy. (When in doubt, create a task force.) More substantially, Mr Obama said he would like to change the proceedings of the secret court that approves electronic spying and interprets counterterrorism laws. Whereas now the court only hears the government’s side of any argument, the president wants to see an opposing viewpoint represented. MORE via American surveillance: The Snowden effect | The Economist. Filed under: analytics, Big Data and Big Government, Blogosphere, Changing Media Paradigm, Civic Engagement, consumers, Culture Think, ethics, ethnicity in politics, geopolitical, Government Works? Do you speak Spanish? America, like the rest of the “Americas,” speaks Spanish quite fluently, prevalently and often. Despite the illusion that North America is monolingual and that being monolingual is somehow more “American,” the truth is that America has been multilingual for hundreds of years prior to the landing of the Niña, the Pinta, and the Santa Maria, followed by May and Flower–the Mayflower, that is, much later. The original experience of the inhabitants of the Southwest, for example, included migration patterns by the native peoples of Central America across the Rio Grande and all the way up into the Dakotas and back. For over a thousand years, the natives of what much later became North America spoke numerous languages and roamed what would become America. The first settlement at St. Augustine, you could say, established the continent’s first European language–Español. St. Augustine was founded forty-two years before the English colony at Jamestown, Virginia, and fifty-five years before the Pilgrims landed on Plymouth Rock in Massachusetts – making it the oldest permanent European settlement on the North American continent. “A record 37.6 million persons ages 5 years and older speak Spanish at home, according to an analysis of the 2011 American Community Survey by the Pew Research Center. Spanish is, by far, the most spoken non-English language in the U.S. The next most spoken non-English languages are Chinese (with 2.8 million speakers), Hindi, Urdu or other Indic languages (2.2 million), French or French Creole (2.1 million), and Tagalog (1.7 million). The number of Spanish speakers in the U.S. has grown rapidly in recent decades, reflecting the arrival of new immigrants from Latin America and growth in the nation’s Hispanic population. Today 34.8 million Hispanics ages 5 and older speak Spanish at home. However, not all Spanish speakers are Hispanic. According to our analysis, some 2.8 million non-Hispanics speak Spanish at home today. That places Spanish at the top of the list of non-English languages spoken by non-Hispanics along with Chinese and ahead of all other languages. (The U.S. Census Bureau measure of non-English language use captures how many people say a language other than English is spoken in the home but does not capture how well or how often the language is spoken). Who are the 2.8 million non-Hispanics who speak Spanish at home? Some 59% trace their ancestry to non-Spanish European countries such as Germany, Ireland, England and Italy. An additional 12% say they are of African American descent. Nonetheless, about one-in-five (18%) non-Hispanic Spanish speakers trace their heritage to a Spanish-speaking country. By comparison, among the non-Hispanic U.S. population ages 5 and older, about two-thirds (64%) trace their ancestry to non-Spanish European countries, 13% say their ancestry is African American and 1% trace their heritage to a Spanish-speaking country. Nine-in-ten (89%) of non-Hispanic Spanish speakers were born in the U.S., a share similar to that for all non-Hispanics ages 5 and older (91%). The racial composition of non-Hispanic Spanish speakers mirrors that of the U.S. non-Hispanic population. Overall, three-quarters (77%) of non-Hispanics who speak Spanish at home are white, 14% are black, and 9% say they belong to some other racial group. Among the non-Hispanic U.S. population ages five years and older, 76% are white, 14% are black, and 9% are some other race. Many non-Hispanic Spanish speakers reside in a household where at least one other member is Hispanic. Overall, 26% of non-Hispanic Spanish speakers live in these types of households. By comparison, just 3% of all non-Hispanics ages 5 and older live in such households. Three-in-ten (28%) non-Hispanics Spanish speakers who are married live with a Hispanic spouse. By comparison, only 2% of non-Hispanics are living with a Hispanic spouse. via Spanish is the most spoken non-English language in U.S. homes, even among non-Hispanics | Pew Research Center. Newspapers are intellectual, cultural and political communication tools that require cultural competencies that reflect the diversity of publics being addressed. Minority employment in daily newspapers has been woefully lacking in the past decade or so. Very little progress has been made since the early 19902 which shows that the numbers have not only fallen as a percent of the total workforce but in absolute quantity since in 1991 the survey measured more total minorities in newspapers (4,900) than we have today (4,700). The numbers are shameful whether we measure ratios or absolutes. This disparity is surely to follow the media workforce online and the band plays on? More via ASNE Detailed Table A – Minority Employment in Daily Newspapers. “The language of news media consumption is changing for Hispanics: a growing share of Latino adults are consuming news in English from television, print, radio and internet outlets, and a declining share are doing so in Spanish, according to survey findings from the Pew Research Center. Half (50%) of Latino adults say they get their news in both languages, down from 57% in 2010. The rise in use of English news sources has been driven by an increase in the share of Hispanics who say they get their news exclusively in English. According to the survey, one-third (32%) of Hispanic adults in 2012 did this, up from 22% in 2006. By contrast, the share of Hispanic adults who get their news exclusively in Spanish has decreased to 18% in 2012 from 22% in 2006. A growing share of Latino adults speak English well. Today 59% of Latino adults speak English proficiently, up from 54% in 2006 and 2000, according to U.S. Census Bureau data. Slowing immigration. As migration to the U.S. has slowed (Passel, Cohn and Gonzalez-Barrera, 2012), the share of Hispanic adults who are foreign born has declined. Today about 51% of Hispanic adults were born in another country, down from 55% in 2006 and 54% in 2000, according to U.S. Census Bureau data. Growing time in the U.S. With the slowdown in migration, the average number of years lived in the U.S. among Latino adult immigrants has grown, from 16 years in 2000 and 17 years in 2006 to 20 years in 2011. More via A Growing Share of Latinos Get Their News in English | Pew Hispanic Center. Are we our brother’s keeper? America seems to be increasingly divided in its opinions in what happens, and even in simply taking notice. The verdict in Florida regarding the shooting of an unarmed teen should raise concern and key questions about guns, court systems, legal justice, race relations, and many other issues of import for the state of our Nation’s social fabric and for the future of an increasingly diverse if separate America. This separation seems to include what we notice and what we care about. Be sure to visit the Policy ThinkShop for commentary on the importance of what happened in Florida for how after the legal system addressed the death of Trayvon Martin millions of people might now see America and how America sees millions of people through the eyes of our local police departments and justice systems. “The final days of the trial of George Zimmerman, which concluded July 13 with a verdict of not guilty, attracted relatively modest public interest overall. In a weekend survey, 26% say they were following news about the trial very closely. This is lower than interest in the initial controversy over Trayvon Martin’s shooting when it erupted last year. In March 2012, 35% said they followed news about Martin’s shooting very closely. However, the story has consistently attracted far more interest among blacks than whites – and that remained the case in the trial’s final days. Blacks are more than twice as likely as whites to say they tracked news about the Zimmerman trial very closely (56% vs. 20%). Moreover, fully 67% of blacks say they watched at least some live coverage of the Zimmerman trial, compared with 38% of whites. About one-in-five blacks (21%) say they watched “almost all’’ of the trial coverage; just 5% of whites reported watching almost all of it. The Pew Research Center survey was conducted July 11-14 among 1,002 adults. In 237 interviews conducted July 14, the day after the Zimmerman verdict, 29% say they were following news about the trial very closely. More via Modest Public Interest in Close of Zimmerman Trial | Pew Research Center for the People and the Press. We the people … Who are we? We are all at one time or another, strangers. Racism is but a word and concept that when put to the test of thought and reason falls short of describing the totality and complexity of many of the situations it, perhaps ironically, so often is a vital part of. Racism as an explanatory concept falls short because outside of “the human race” all the other constructs relating to race do not hold up to scientific scrutiny. There is only one kind of human being, though we are all quite different. Historically those differences have divided us and caused some of us to treat other people in inhumane ways. The construct of “White person” has been used historically to bring together a normally disparate collection of people. The early KKK included a diversity of people from different religions and ethnicities. This collection of disparate people were united in their apposition to the empowerment and liberation of antebellum South people–African Americans who had been enslaved because they were brought to America as muscle for work and were labeled, legally, as somewhere between animal and human. There is much psychosis and ill will in the history of the American Republic and as inheritors of that legacy, White people (however one defines the complex category) must live with that history. Black people must also live with that burden as victims and objects of hostility. As Americans, we all have a responsibility to address that past and to make sure that it does not dominate our present or future. There is no more important a challenge for the future of this Republic. America cannot go on closing its doors and incarcerating people who do not fit an antiquated norm. America must work on reinventing itself and forging a culture that will better define what it expects from its citizens and one that is more attentive and inclusive of what it needs from the future than what it needs from its past. America must be more forward looking and embracing of people’s differences. That will not be easy… but it must happen. It cannot be done piecemeal through divisive movements and competition… Stakeholders in a future multicultural America must forge a value system that can be taught at home by parents, in school by teachers, at religious gatherings by spiritual leaders and in corporate America by managers. America increasingly looks different and we must figure out how to make the differences among us work if we are going to stay competitive in a competitive world. Can America talk its way out of the race problem? In important ways, racism speaks to the fears and phobias held deeply by people who fear black people, especially men America labels “black.” The reasons White people fear them may be debatable, but their discomfort with “the black stranger” cannot be explained away. George Zimmerman was afraid and emotional enough that night, that he could not simply say: Good evening. What is your name? I am the neighborhood watch guy and I do not know you? Can we talk? Perhaps he could have said something like that and a simple conversation could have unraveled. Perhaps avoiding the confrontation that ensued. When a person feels strong and negative feelings about another person, because they are strange and foreign to them, it is understandable. But when a person feels these feelings about a person who is black or African American, that person is acting on prior perceptions and images that are a part of American history and we, as a Nation, hardly know how to talk about that. But history is not simply Black and White. America is still not able to get over its “Black and White psychosis.” The mainstream American hegemonic culture has not processed differences and cultural conflicts between groups very well. That is the most deleterious outcome of its psychosis. Although White and Black hostilities are well documented and talked about, the lynching of Native Americans and Mexican Americans that went on in the mid and southwestern states is rarely mentioned. American consciousness and history is so twisted that today Hollywood portrays yesterday’s predominantly “brown” cowboys in the erroneous image of blond haired and blue eyed John Wayne. Intergroup competition, mistrust, hatred and violence are as old as the New England witch hunts, Southern White terror and abuse and exploitation of immigrants to America. But intergroup competition and mistrust, intergroup hostilities in the face of reason and laws is not new. What is new is the proliferation of guns in our country–both urban and suburban, legal and illegal. Mistrust and divisions between groups that increasingly fuel and dominate our electoral politics and discourse do not bode well for an America that is already on guard about teenagers shooting up our schools and theaters, disgruntled and unstable young people blowing up Federal Buildings in Oklahoma, and homeland terrorism born of immigrants from anticommunism wars that armed and trained religious minorities throughout Europe, Asia and the Middle East. History is very much with us and we are doomed to repeat it. The violence that ensued between George Zimmerman and Trayvon Martin is very much embedded in racial history and mistrust. Mistakes happen, but guns have to be carrier by choice and how we define and treat one another in any situation has roots in how we were brought up and how “the other” looks and “feels” to us. Hope lies in the hearts and minds of today’s young. But it will not survive for long if we allow police departments, States like Florida and the media establishment to make the mistakes and the politically motivated laws that promote vigilantism and hostility between neighbors. For example, the stand your ground law apparently does. What kind of society have we become that we allow excessive use of violence no matter what? 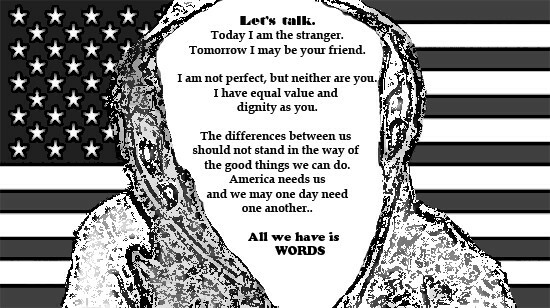 In a diverse society where so many of us treat one another as “the other” or “the stranger” we cannot afford laws and court systems that allow anyone to define another person, and based on how they define that person, feel fear for their lives and kill them. That is insane and that is what is wrong with the Florida court system today. Something is terribly wrong in American justice today. On the one hand, there is this slavery and civil rights history that is somewhat alien to most of today’s young people (today’s young people, of any race or ethnicity) and is somewhat stuck in the past for the rest of us. Civil rights is no longer about black and white. The country is much different today and in important ways the current generation that will matter, in terms of what happens in the next quarter century (young people between the ages of 15 to 35) is up at bat. What are young people on all sides and from all communities going to do to make the future America kinder and gentler? What ever happened to community and neighborhood? Florida justice on trial as the nation watches the justification of profiling and following that led to a senseless killing. More via Zimmerman Is Acquitted in Killing of Trayvon Martin – NYTimes.com. The American dream, even “What is America?”, hangs in the balance as the Nation decides what to do with 40 million immigrants to this land. The act of becoming a U.S. citizen is increasingly under a public microscope of political scrutiny. The lens through which we see immigrants today is increasingly made more opaque by the currently divided American polity, and the fear and controversy brewing over our National borders. As the country struggles with economic recessions, NSA scandals, the aftermath of homeland terrorism, and crisis in its educational, incarceration and healthcare systems, it is not in a generous mood to take in the world’s huddled masses yearning to be free. “As Congress debates a comprehensive immigration bill, one key element under consideration is whether to offer a pathway to citizenship for the nation’s estimated 11.1 million unauthorized immigrants. If a bill were to pass including such a provision, how many would take advantage of the opportunity? The answer is of course speculative. The Pew Hispanic Center has conducted surveys and analyses of government data that offer some insights – but not all of them point in the same direction. A survey we conducted in 2012 found that more than nine-in-ten (93%) Hispanic immigrants who are not citizens said they would like to become a U.S. citizen. This was true both for those who are legal permanent residents (96%) and for those who aren’t (92%). The vast majority in the latter group is in the country illegally. Despite this near universal expression of a desire for citizenship, our analysis of government data shows that a majority of Hispanic immigrants who are eligible to seek citizenship have not yet taken the opportunity to do so. Only 46% of Hispanic immigrants eligible to naturalize (become citizens) have, compared with 71% percent of all immigrants who are not Hispanic and are eligible to naturalize. The naturalization rate is particularly low among the largest group of Hispanic immigrants – Mexicans – among whom just 36% have naturalized. More via If they could, how many unauthorized immigrants would become U.S. citizens? | Pew Research Center.